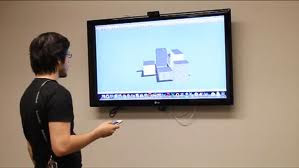 CadRemote from Maide, Inc. will make your meetings run smoothly, making it easier to present and communicate your design intent, annotate a central model, take images with you on the go, and use your iPhone as a remote control for 3D space. CadRemote works like a Wii for your Rhino. Touch and hold your finger on the screen to activate the gyro, and move the phone around to rotate your model. Move your finger to pan around the model, and use the side bar or pinch to zoom. If you get lost, use the zoom extents button to re-orient yourself in the model. Tap the mouse icon to turn off 3D navigation and turn the app into a mouse pad. Use the touch screen to left and right click, as well as drag. This allows you to open new files, switch between programs during a presentation. While you are connected to a model, you can pull a screen render to your iPhone. Use this to save views to take with you, send images to other individuals via the email functionality within the app, or use the iPhone to annotate the images. Our onscreen tracing functionality lets you to draw directly on the main screen, as well as on the image on the device. The most important part of CadRemote is its multi-device capabilities. Although many people can connect, only one person can input commands at a time. This makes passing control between people simple and intuitive. Connect your colleagues devices to your model during a review and they can easily interact with your model. Annotation and control is shared and each person gets their own sketching color. iPhone is getting more advanced these days, it's good to see that now with it we can have a good control to 3D models too. It seems that to ease your work each and every application is available now.